Before I get to the FO, I have a question for you: did you ever wonder what your teachers looked like around 8pm on any given night during the first week of school? My poor, dear, exhausted Fiasco! He has officially survived his first week of teaching middle school science. I am so incredibly proud of him… even if he can’t keep his eyes open much these days. 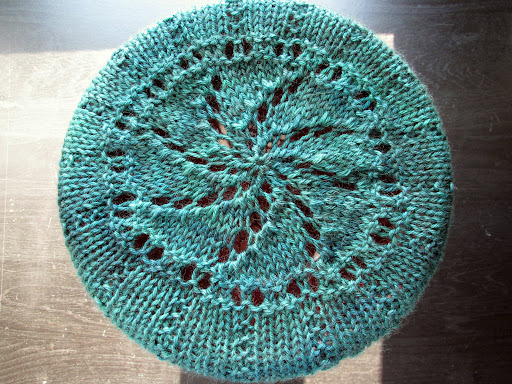 Back to knitting: I finished my final Beribboned Hat sample! 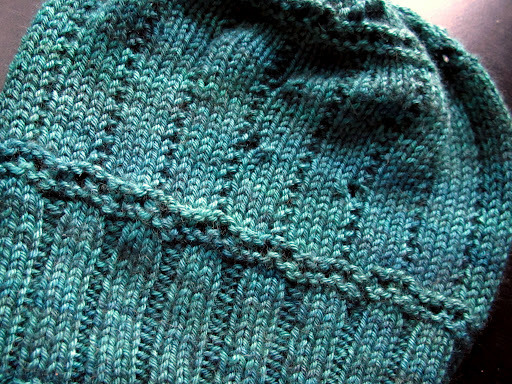 I love freshly-blocked lace, don’t you? Guys, I LOVED knitting with this yarn. Mondegreen from The Verdant Gryphon is truly fantastic. The finished fabric has a lovely silky, drapey feel. I will be sure to sound the alarm here when it finally goes on sale. Those holes above show where the ribbon would go. I didn’t have time to lace it up before dashing off to work this morning, but I do have the perfect color ribbon for it. Fear not, though, soon you will see this hat in all its glory. This weekend I will be going to Boston for a dear friend’s wedding and am planning to coerce some of my friends into modelling for me. 🙂 If all goes well, the pattern will be available on Monday! Remember, if you would like to sign up for my email list to find out exactly when I release patterns and other such exciting news, you can do so here. This entry was posted in FO, FOFri, hats by shoelaceswitcher. Bookmark the permalink. Love the hat, and the stunningly accurate portrait of modern life. The collapse from exhaustion in PJs and with some kind of tech in hand, we've all been there. Hope you both enjoy the three day weekend though! That hat is beautiful! I would love to give the pattern a try. The color you chose is perfect. Thanks for stopping by my blog! haha, exactly! Poor guy tried playing that game for three days and failed every time. Have a great weekend, too! That will be so pretty when it has the ribbon, you did a good job picking your color and yarn and designing it! 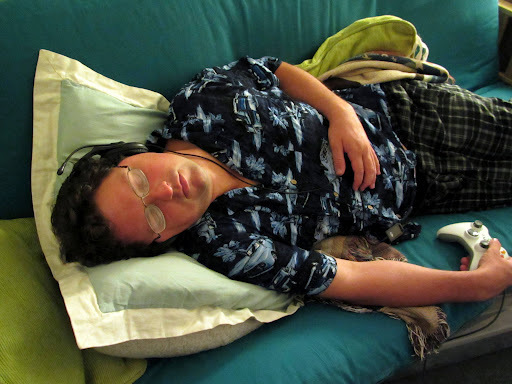 The really, really embarrassing thing is that I've fallen asleep just like that before, with xbox controller in hand. Hopefully you found it adorable like my guy did! Mmmm and that yarn looks divine, especially in that colorway. I hope you use that one for the pattern photo! I fall asleep like that all the time! That hat looks gorgeous, the color just pops!